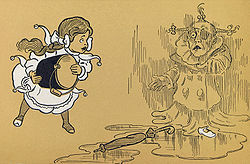 ^ Katharine M. Rogers, L. Frank Baum, pp. 73–94. ^ Verdon, Michael (1991年). The Wonderful Wizard of Oz. Salem Press. ^ The Annotated Wizard of Oz: The Wonderful Wizard of Oz – Lyman Frank Baum. http://books.google.com/books?id=bpkVEAaUuMkC&pg=PR63&lpg=PR63&dq=evelyn+copelman+illustrator+wonderful+wizard+of+oz&source=bl&ots=Hy4-zRTzqZ&sig=wSMVoTMg-8GO4gQijXwRmGYWucg&hl=en&sa=X&ei=MhwkUsCtNZCvigKwsIHwCA&ved=0CEcQ6AEwAw#v=onepage&q=evelyn%20copelman%20illustrator%20wonderful%20wizard%20of%20oz&f=false. ^ a b Baum, L. Frank; Hearn, Michael Patrick (1973). The Annotated Wizard of Oz. New York: C.N. Potter. p. 38. ISBN 0-517-50086-8. OCLC 800451. ^ Algeo, J., "Australia as the Land of Oz", American Speech, Vol. 65, No. 1, 1990, pp. 86–89. ^ a b c Delaney, Bill (2002年3月). The Wonderful Wizard of Oz. Salem Press. オリジナルのNovember 25, 2010時点によるアーカイブ。. http://www.webcitation.org/5uWBcUewP 2010年11月25日閲覧。. ^ Riley, Michael. "Oz and Beyond, The Fantasy World of L. Frank Baum". Lawrence, University of Kansas Press, 1997, p. 51. ^ Baum,Lyman Frank. "The Wonderful Wizard of Oz". Harpers Collins, 2000, p. 5. ^ Hearn, Michael Patrick (1983). The Wizard of Oz (1st ed.). New York: Schocken Books. pp. 146–147. ISBN 0805238123. ^ Baum, L. Frank (1917). The Lost Princess of Oz. Chicago: Reilly & Britton. p. 13. ^ Dighe, Ranjit S. (2002). The Historian's Wizard of Oz. London: Praeger. p. 126. ISBN 0275974189. ^ Dighe, Ranjit S. (2002). The Historian's Wizard of Oz (1st ed.). London: Praeger. p. 57. ISBN 0275974189. ^ Bryan, William Jennings. “Cross of Gold Speech: Mesmerizing the Masses”. Official Proceedings of the Democratic National Convention Held in Chicago, Illinois July 7, 8, 9, 10, 11 1896. ^ Dighe, Ranjit S. (2002). The Historian's Wizard of Oz. London: Praeger. p. 61. ISBN 0275974197. ^ Dighe, Ranjit S. (2002). The Historian's Wizard of Oz. London: Prager. p. 67. ISBN 0275974197. ^ Bryan, William Jennings (1897). The First Battle. Lincoln: Thomson Publishing. pp. 617–618. ^ Dighe, Ranjit S. (2002). The Historian's Wizard of Oz. London: Praeger. p. 45. ISBN 0275974197. 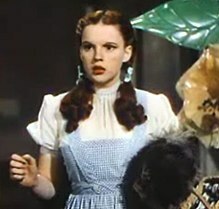 ^ David B. Parker, "The Rise and Fall of The Wonderful Wizard of Oz as a Parable on Populism," Journal of the Georgia Association of Historians, 15 (1994), pp. 49–63. ^ Watson, Bruce (2000年). “The Amazing Author of Oz”. Smithsonian (Smithsonian Institution) 31 (3): 112. ISSN 00377333. ^ To See The Wizard: Oz on Stage and Film. Library of Congress, 2003. ^ Hourihan, Margery. Deconstructing the Hero. p. 209. ISBN 0-415-14186-9. OCLC 36582073. ^ Fisher, Leonard Everett (2000年). “Future Classics: The Wonderful Wizard of Oz”. The Horn Book Magazine (Library Journals) 76 (6): 739. ISSN 00185078.